If you’re thinking of buying a new phone, but were wondering what you’d do with the old one, Flipkart has your back covered. With the ‘Buyback Guarantee’ offer a month back, Flipkart has extended the feature to other smartphone brands such as Lenovo, Vivo, and OPPO. Flipkart is expecting a rise in smartphone sale and hence introduced the offer with leading smartphone brands for its upcoming Big10 sale. The Flipkart BuyBack Guarantee offer was exclusively valid on Motorola Moto G5 Plus smartphone earlier. The pilot run program which started in March was a success and hence Flipkart decided to make the facility a permanent feature for smartphones after the Big 10 sale. The offer allows you to exchange your phone at a specified price when you purchase a new smartphone via the e-commerce site. The ‘BuyBack Guarantee offer’ will ensure that customers can sell their old devices to Flipkart and receive a decent amount when they buy a new smartphone. The facility will be launched for Lenovo, Motorola, Vivo and Oppo models for Rs 399. However, this particular price tag could be bumped up a little once it extends to covering more devices. Commenting on extending the offer to leading smartphone brands during the Big10 sale, Ayyappan Rajagopal, senior director of smartphones at Flipkart said, “This kind of program, along with other affordability programs (low-cost EMI and other) will offer a 50-70% jump in sales in general, but during sale time, the increase in likely to be in the range of 2x to 2.5x”. He further added that the program will be offered across smartphone models from products priced between Rs 10,000 and Rs 80,000. Customers will be offered between 35% to 50% of the MRP of the phone when they exchange their old phones for new smartphones anywhere between 6-8 months, depending on the terms and conditions at the time of buying the phone. While this is the first time such an offer is being offered in India, it’s rather common in the US with higher premium devices such as the iPhone. Flipkart has introduced this offer in India for smartphones across various price categories. Flipkart further expects 50% of its online shoppers to opt for options like No Cost EMI and Product Exchange on the purchase of any new smartphone. The company also points out that this is the first time when No Cost EMI will cover over 50% of the smartphones portfolio across popular brands. 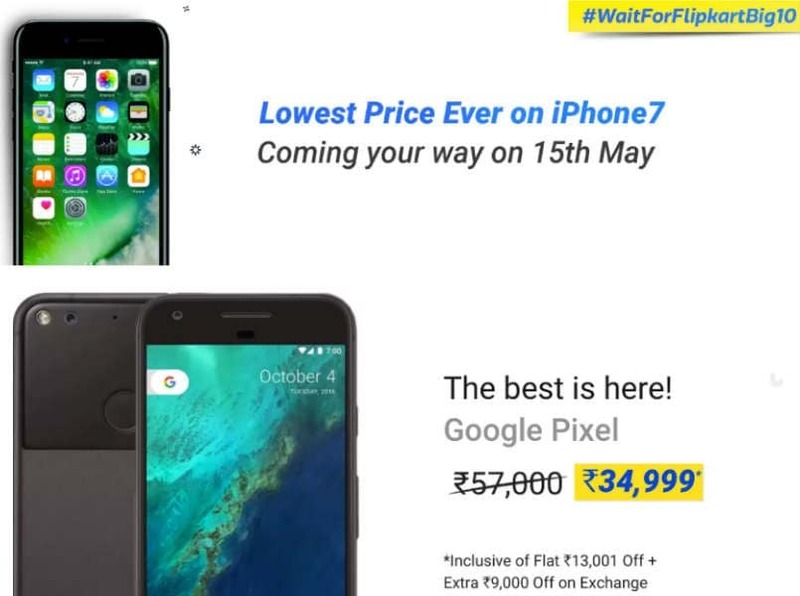 In its sneak-peek, Flipkart has teased that during the Big10 sale, Apple’s iPhone 7 will be available for ‘lowest price ever’, while the Google Pixel smartphone will be available for Rs 34,999 down from Rs 57, 000. To put things into perspective, the Flipkart’s Big10 sale will commence on May 14 and will run up to May 18. However, if you are willing to buy some mobile, electronics or accessories then you might want to check Flipkart from May 15- May 18.